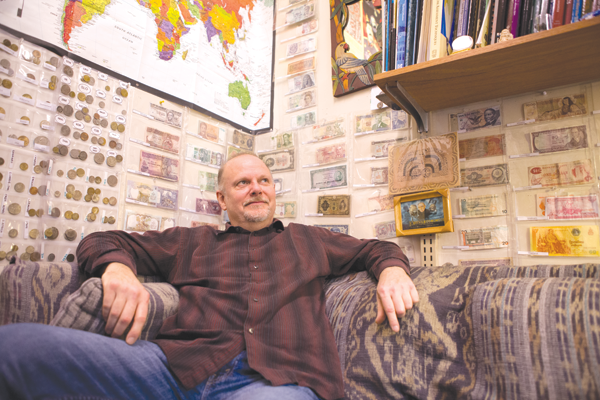 As you sit on his couch, you can’t help but notice the myriad of foreign artifacts strewn across his walls; Balinese masks, Thai silk, rows upon rows of foreign currency. At first, you might not know what thing to ask about, but pick one and you’ll find that there is a story behind it. This is the office of Tim Payne, professor of Micro and Macroeconomics at Shoreline and while his stories range from road trips to retired CIA agents, Payne’s most noticeable passion is traveling. Having accompanied Payne on study abroad trips to Bali and Thailand as well as many eastern European countries outside of work, Knauf says Payne has a playful and original approach to engaging people from other countries. Having grown up in a small town in Missouri, Payne says that he wasn’t always interested in international travel, for the knowledge he had about the outside world was obscured by economic reality. His family had a modest income and Missouri was relatively isolated from international opportunities. By “out there” Payne meant agricultural work, beginning his first job at age 14 picking onions in Walla Walla, Washington. By 16, Payne was packing and shipping produce in processing plants and by the time he had graduated high school he had begun doing wheat seed hybridization research while simultaneously pursuing a bachelor’s degree in Business administration. Conducting fertility tests on female and male wheat seeds, Payne’s optimism came to a halt when he realized that the non-fertile seeds he thought were being discarded by the company were actually being sold to farmers. Having already paid his way through undergraduate school through this work, Payne quit his job to pursue a Masters in Economics at Washington State University where he says his interest in international travel first started. While the faculty of the school were discussing the need to teach a new economics class in energy economics, Payne was considered for the job opening although he was still a graduate student and not a professor. Payne says that while he enjoyed teaching, he began to feel slightly disingenuous when he started teaching a class on international economics, for he had never done any international travel of his own. “I did a really random thing at home where I had some friends over. I said ‘There’s a map on the wall, let’s just pick a country’ and they said ‘Hey do you have some darts?...So I threw a dart and it hit somewhere out in the Pacific Ocean. I threw the dart again and it hit Thailand.” So his first international experience started in Thailand. Today, having led several study abroad trips to Southeast Asia and having traveled extensively on his own, Payne realizes that travel and economics have become a way of life for him. While other people are out snapping pictures, Payne says he’s watching people living and working and shopping, building merchandise and cultivating farmland to stimulate their economy. In his classes at Shoreline, Payne incorporates these travel experiences into his lectures, making his material applicable to an international audience that may not be as invested in the American economy as domestic students. Sometimes a professor’s office isn’t always a place where students feel they have something to relate to. Any student that steps into Payne’s is bound to find something.